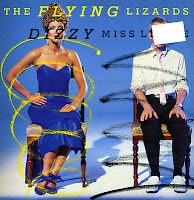 In 1984, the Flying Lizards released an album consisting entirely of covers, called 'Top Ten'. The covers were deliberately done in an emotionless, harsh and robotic style. 'Dizzy miss Lizzie' was one of them, a track originally written by Larry Williams in 1958 and covered many times since, most famously by the Beatles on their 1965 album 'Help!'. I got to know the single shortly after its release via television. A strange music video accompanied the song, which you can see below. It was this video that made me interested in the song - but I had a heard time finding the single. Instead, I bought the 12" single when I saw it years later. The B-side 'Gyrostatics' is a sonic experiment not too dissimilar from tracks by Art of Noise. 'Money' was first recorded by Barret Strong back in 1959. 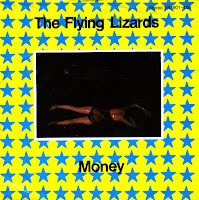 It was covered by the Beatles and then much later in 1979 by the Flying Lizards. They were a British experimental rock group, making their name with this and other postmodern cover versions of songs. At a very young age I was confronted with this song and I liked it a lot. I was especially impressed with the fact that the song continued on the B-side, with instrumental improvisations.